Somaliland: Eulogy For Hersi Haji Hassan’s Ill-Fated Political Career. Today We Mourn The Death Of The Political Career Of Mr. Hersi Ali Haji Hassan. May It Rest In Peace. A Political Career Wielded By The Most Powerful Minister To Ever Grace Somaliland’s Political Arena And Currently The Leader Of The Wadani Opposition Group. It Is A Political Career That We Will All Miss And Wonder What It Could Have Turned Into, Perhaps A President One Day But It Was Not Meant To Be. We want to make sure that people understand Mr. Hersi himself is fine, we cannot stress this enough, his political career however decided to throw itself off a roof of a short building and onto oncoming stampeding hordes of Social Media Trolls and Turning Itself Into A Punching Bag For Former Colleagues, Rivals and the General Citizenry. The cause of death of this illustrious political career is a gross Miscalculation that has caused it major injury in the past, in fact 3 years ago to be exact but it survived and came back stronger and almost carried the opposition party across the finish line to victory. Amazing! This time, the miscalculation came by way of a new career this supernaturally ambitious political career has tried its hand on – writing a memoir to share of its exploits and the heights it grazed with the general public. This Literary Work Has Ignited Somaliland’s Media into a flaming ball of he said she said. This is a work the likes of which has never been seen in Somaliland before for it Turned Ordinary people into overnight Constitutional Scholars, Prosecutors, Book Critics, and the Occasional Human Shields. The content of the book though written in Somali has confused most people and they are finding it difficult to get the same reading and have caused some to quote other famous literary work by characterizing it as a new interpretation of Ides of March set in modern Somaliland. 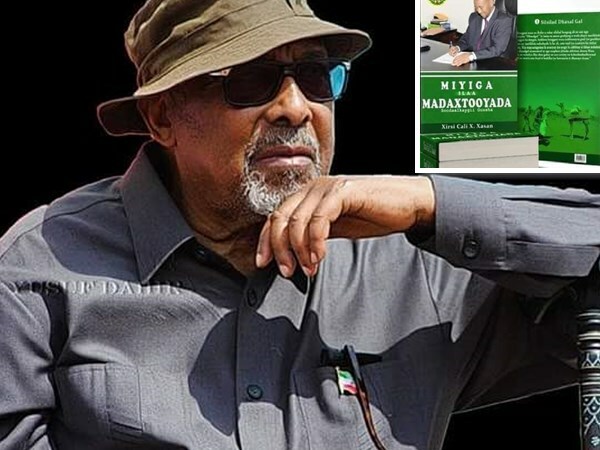 Others have Hailed it the ultimate Truth teller as far as political careers go and finally informing the public on Important Chapters In Somaliland’s History, Albeit 8 Years Late. The Political Career by itself was helpless to try to quiet the crescendo of Misunderstanding that is caused by the Book and has Enlisted Mr. Hersi, the real Mr. Hersi to explain the meaning of this Green Colored Object he is holding in His Hand. The event was as hyped by Horn Cable TV and was every bit worth the wait as Mr. Hersi Showcased His Oratory Skills Next To A Hapless Reporter On Live Television Using Just The Power Of Repetition And Won The Debate Against Himself. Mr. Hersi’s Political Career is being Mourned Privately by many other political careers, some already on life support and others suffering Mini-Scandals of their own until this brave and selfless political career took one for the team and gave a much-needed reprieve to these other political careers that were Increasingly in the Public Eye. In an act of true altruism, Mr. Hersi’s departed political career has given one last gift of throwing itself in front of a marauding hoard of internet trolls, truth tellers and the Occasional Political scavengers. What we know is that the Cause of Death Is Confirmed to be a case of repetitive and chronic political Miscalculation.